Lisfrank Injury | WILL I EVER DANCE AGAIN? This injury affects the mid foot region at the tarsometatarsal joint. The injury is named after a French surgeon who had described an operation in this area of the foot. Luckily the injury is very rare but can vary in its severity form a sprain to a full fracture and dislocation. The injusy is normally sustained with too much pressure in full plantarflexion/ pointed foot. This injury leads to injury of the ligaments over the joints, and sometimes even a fracture at the bottom of the metatarsal heads. The foot can be split into 3 parts, the forefoot (metatarsals and phalnges) the mid foot (small bones cubiod, cuneiforms, navicuar) and the hind foot (talus ad calcaneum). The lisfrac joit is inbetween the fore foot and the mid foot. 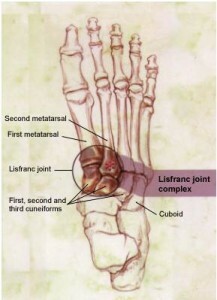 The Lisfranc ligament is a large band of tissue that spans the medial cuneiform and the second metatarsal base on the underside of the foot.. The joint capsule and ligaments on the top of the foot form only a small amount of support on the top surface of the Lisfranc joint.There are also a lack of transverse ligaments between the 1st and 2nd met bases. This anatomy establishes a “weak link” that, with stress, is prone to injury. As there is normally a traumatic event wherein the foot is injured the symptoms will arise quite quickly. As with all soft tissue injuries there will be pain, swelling, heat and some redness. Pain will be felt in the mid foot area increasing with walking or even standing. There will be alot of swelling over the top of the foot and it will be tender to touch. It will be sore to point the foot also. If fractures have occurred there will be some pain at rest too not unlike a tooth ache. Diagnosis can be very difficult and may not even show much on xray unless substantial disruption is present. Diagnosis is made from symptom presentation and history of trauma. Remembering that the trauma may be external, from a knock or blow, or from too much twist/force on a planted foot in either point or demi point. Treatment protocol will vary depending on the severity of the trauma. A period of immobility in a boot is often required from 4-8 weeks. This will need to be followed by foot rehabilitation exercises in the clinic setting. Operative procedure may be required if the injury is severe. It doesn’t always have a great outcome and may lead to further mobility problems in the future with arthiritc changes in the lisfranc joint. Recovery time will depend on the severity of the injury. If the sprain is relatively small and only a small amount of time is required to immobilise then recovery may only be a couple of months. If surgery is required however , or non surgical treatment of a bad sprain/dislocation, recovery time will be longer. As with all injuries it is important to see your rehab through until th very end. This means working on range of movement, strength, balance, power and integration into sport. This type of injury is often sustained by external forces that are beyond our control.